Not only do tires play a critical role in the performance of your vehicle, but a lot of information can be garnered about what happened before, during, and after a crash. We will explore tire marks and, generally, what those marks tell us. First let’s talk about where the marks come from. Skid marks are created by the intense thermal relationship of a tire against the roadway surface during extreme stresses put on the tire, a simpler way to say this is a tire will “marks” when it nears, or exceeds, the limits of its relationship with the roadway. These marks happen because the oils in the roadway and/or the tire(s) are brought to the surface and “burned or melted” to the roadway. If a tire is heated enough it will be obvious as the surface of the tire will have changed, it will have a flat spot and obvious abrasions. Light to dark or dark to light. 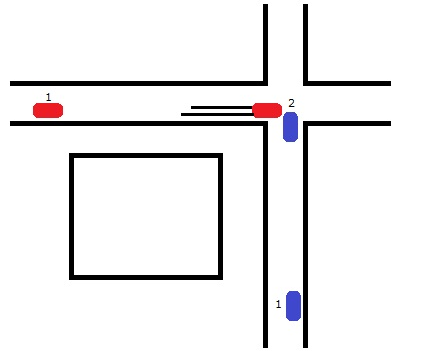 All marks can be put into two categories when referencing the direction of the vehicle which made them. Light to dark marks (in the direction the vehicle was traveling) support a vehicle making the marks during some form of deceleration (extra points if you wanted to read “negative acceleration”). Dark to light marks (again, in the direction the vehicle was traveling) support a vehicle making the marks during some form of acceleration, usually excessive wheel spin. Darker in the middle, darker on the outsides, or uniform. Marks which are darker in the middle indicate a tire which is overinflated, conversely marks which are darker on the outside edges indicate a tire which is underinflated. Marks which are uniform in nature indicate a properly inflated tire. Please read the 2 articles on tires to understand the significance of either over or underinflated tires. ABS (Anti-lock Brake System) marks are lighter than standard marks and have more tire tread definition in them, Non-ABS marks rarely have tread definition in them. ABS marks are also shorter when compared to non ABS marks from a vehicle traveling at the same speed. What else skid marks can tell us? As you have already discovered skid marks can tell us about the tires inflation, ABS or non-ABS braking, and direction of travel. Skid marks can also tell us something else, when and where the decision to brake occurred. This is perhaps the most under-utilized and under explored aspect of collision reconstruction – even more so in lower speed collisions. Some basic calculations can be made, using various aspects of the skid marks, to determine where the driver made the decision to brake. Why is this so important? Consider the following illustration. This drawing is a classic teaching example used to show the value of skid marks. Consider this scenario, the blue car says he had the green light and was hit in the intersection. The red car says he also had the green light and saw the blue car so he braked hard. There is no other evidence or witnesses to further determine the cause. Now the student would be asked to calculate the position of the cars when the decision to brake was made using the start of the skid marks, ultimately this would place the vehicles in the position labeled 1. Now the obvious problem with the red car’s scenario now that we have used the skid marks to determine where he decided to brake, a building blocks his view of the blue car (position 1 for both vehicles). This begs the question as to why did he decide then to brake? The answer, the light was red for the red car and the driver was braking for traffic light, not the blue car making the red car culpable in this scenario as the physical evidence verifies the “at fault” party. Another valuable piece of information is that rubber is biodegradable and there are naturally occurring nitrogen based bacteria that “eat” rubber. These bacteria are aggressive and will eat rubber in most environments, therefore if you are attempting to determine causality and the “at fault” party, it is in your best interest to take pictures of the roadway as soon as possible. Often skid marks are gone in a relatively short amount of time. Skid marks are a valuable piece of evidence and a great tool for determining many factors in a collision; it’s very important none of them are overlooked or underestimated. Patrick Sundby has decades of experience in the automotive industry including several years in law enforcement collision investigation. He has also been a driver training and firearms instructor in law enforcement and a police officer for 9 years before specializing in accident investigations. He has had the privilege of participating in both learning and teaching at Prince William County Criminal Justice Training Academy in Virginia and studied at the Federal Law Enforcement Training Center in Georgia. His specialty is low speed and catastrophic crashes and has testified over 500 times at various level. He can be reached at Patrick.Sundby@GMail.com or 571-265-8076. Dr. Mark Studin is an adjunct associate professor of chiropractic at the University of Bridgeport College of Chiropractic, an Adjunct Professor of Clinical Sciences at Texas Chiropractic College and a clinical presenter for the State of New York at Buffalo, School of Medicine and Biomedical Sciences for postdoctoral education, teaching MRI spine interpretation and triaging trauma cases. He is also the president of the Academy of Chiropractic, teaching doctors how to interface with the legal community (www.DoctorsPIProgram.com). He teaches MRI interpretation and triaging trauma cases to doctors of all disciplines nationally, and studies trends in health care on a national scale (www.TeachDoctors.com). He can be reached at Drmark@AcademyOfChiropractic.com or at 631-786-4253.